The following vehicle had an idle surge from 1500 – 1800 RPM. A new throttle housing was installed to remedy the problem. After the part replacelent, the idle surge became worse. When the engine is started the idle surges up and down. No fault codes were stored. When replacing the throttle housing (throttle body) you have to perform an Idle Air Volume Relearn. It is important to follow directions very carefully. If the relearn does not work the first attempt, try again. It has taken me a few relearns in the past to push it through. Before performing Idle Air Volume Learning, make sure that all of the following conditions are met. Idle Air Volume Learning will fail if any of the following targets are missed for even a moment. 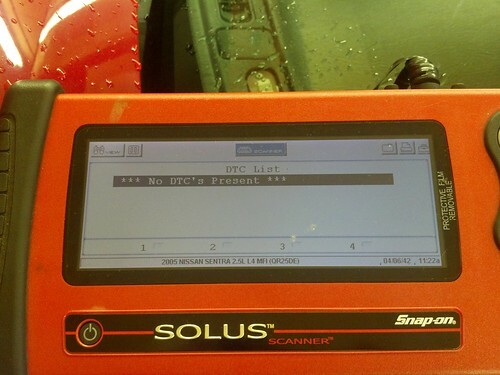 The following video highlights the idle air volume learning procedure using an advanced scan tool with Nissan factory options. When performing the throttle body adaption portion of the procedure, you will hear the throttle body open and close. If this does not occur, the procedure has failed. Attmept again or correct problem prohibiting relearn. Throttle valve is fully closed. Check that downstream of throttle valve is free from air leakage. When the above items check OK, there may be a defective part prohibiting relearn. Run your diagnostic strategy. Nissan Sentra 2000, 2.0L Engine, 102,000 mileage. When climbing incline and reaching speed between 35 to 40 mph, the engine fouls or misfires but once it pass that speed the engine will recover and run smooth again. At times misfire also occurs at the low starting speed of 0 to 10 mph. Then the engine recovers and will continue to run okay How do we solve this problem. Thank you!